German lawmakers have called for an investigation of Turkish intelligence operations in their country, specifically charging that Turkey is spying on suspected followers of exiled cleric and accused coup mastermind Fethullah Gulen. The Financial Times sees this new controversy stacking with a recent German government report about Islamist radicalism in Ankara to create big problems for Chancellor Angela Merkel, who is fighting to defend the EU-Turkey refugee pact. Merkel’s critics in Germany have said the pact makes too many concessions to Turkish President Recep Tayyip Erdogan, in essence, going easy on his increasingly authoritarian government because Germany needs his help to keep the refugee situation in Europe from growing even worse. The Financial Times reports that Berlin Mayor Michael Muller said he was recently asked by a representative of the Turkish government to take action against Gulen followers living in his city. German officials have also complained about the undue influence Erdogan exerts on Turks living in Germany through a political lobbying group called UETD, and through Ditib, a network of “900 Turkish mosques, which has organized the posting of 970 Turkish-trained imams to Germany.” These mosques are also alleged to have a disturbing level of control over Islamic education in German schools. The Express quotes German media reports that “spies write reports on the alleged Gulen supporters and the secretive information is collected from imams of the Turkish-Islamic Union of the Institute for Religion,” which is the formal name of the Ditib network. “For example, an imam in Westerwald, Germany reported when suspects changed positions after the coup and their family links. According to the well-respected Die Welt newspaper, a lot of people who are being spied on are German citizens,” the Express adds, citing similar complaints about Turkish imams spying on Turkish populations in Bulgaria, Norway, and Switzerland. Concerns have been voiced about Erdogan using mosques and community organizations to exert his influence in Germany for quite some time. “The Erdogan government’s control of mosque unions in Germany leads to him increasingly misusing these unions as a mouthpiece for his despotic policies. These unions are instrumentalized by Erdogan to establish a very dangerous kind of Islamism that is contrary to basic rights,” Left Party MP Sevim Dagdelen told Deutsche Welle in June. “If mosque unions controlled by Erdogan try to exercise political influence, the critical media will have a tough time being heard. 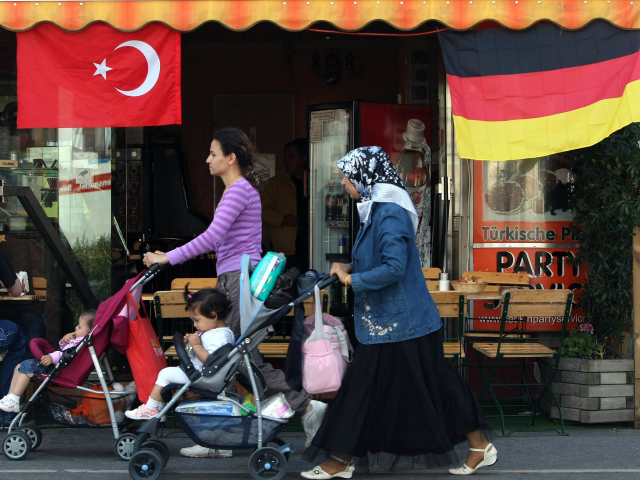 This means that millions of people here in Germany are being showered with Erdogan’s inhuman propaganda – and the German government is not paying attention,” Dagdelen added. Deutsche Welle also cited concerns that Turkish Germans don’t identify with German politics and have very low rates of electoral turnout — an assimilation problem that will only be exacerbated if Erdogan (and Gulen) continue using community organizations in Germany to manipulate and intimidate Turkish emigres.